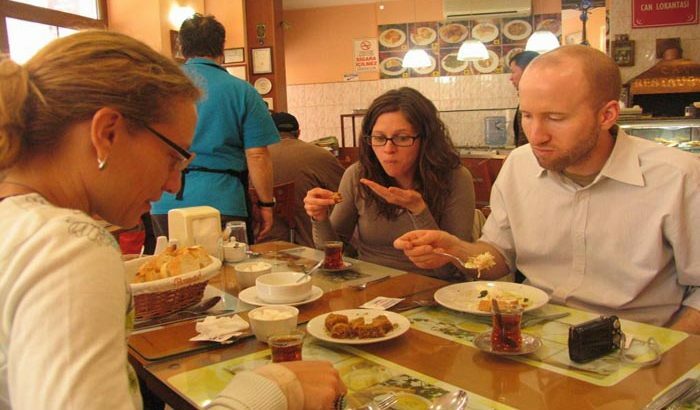 Food Tasting – Gastronomy Tour in Istanbul. In the depths of Goldenhorn, where quite few tourists ever set foot, lie the real treasures of Istanbul: Oldest surviving residential areas in the historical peninsula adorned with houses, mansions,institutions and temples of every sizable ethnic and religious group of the once quite cosmopolitan imperial city. These treasures and many other remnants of the glorious history of the city serve as the backdrop of our Goldenhorn Gastronomy tour. This makes the tour already an exceptional food tour. After all you don’t get to see this much of impressive monuments in a regular sightseeing tour! All from hill-top imperial mosques to the byzantine churches and orthodox patriarchy, from a Unesco conservation area in the hills to the most picturesque streets of the city alongside the former sea walls are in the itinerary of this exceptional tour. As magical as its setting is also the food in Goldenhorn Gastronomy tour. It is no wonder that the neighbourhoods, which are by far the oldest in the city, are also host to some of the oldest food traditions of Istanbul. 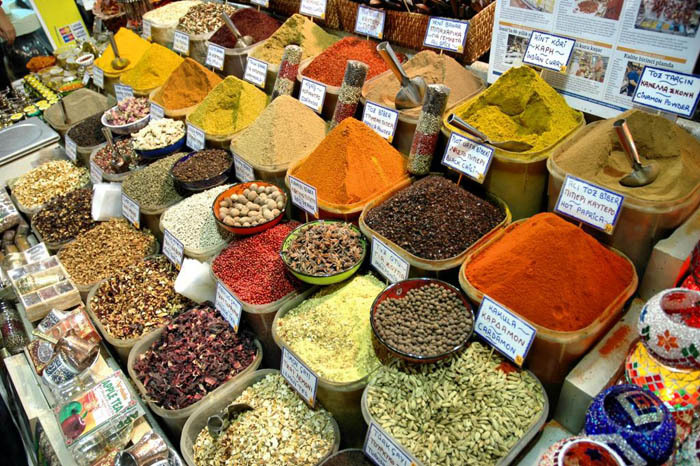 To be more precise, the area with its historic food establishments and extraordinary food masters is the foremost gastronomic center in Istanbul when it comes to Turkish food. We must add at this point, that we had the hardest time setting up the food itinerary of this tour as there is no shortage of mind-blowing tastes in this area. After a meticulous selection of the endless array of food and sightseeing options in the area, we created a tour we are proud of. Since the tour itinerary covers a large area, however, we must warn, that it is more physically demanding than our other tours. But if you are the adventurous foodie, which wants to admire the history of the city in common neighborhoods instead of overcrowded touristic areas and which doesn’t want to settle for good food, when there is exceptional food, this tour is something for you..
Admire the aqueduct and cisterns of the impressive roman water supply system. Enjoy spectacular Goldenhorn views and common neighbourhood sceneries. Remarking dietary restrictions, should there be any, during booking can help us modify the tour as much as possible according to your specific needs. Comfortable walking shoes are recommended as the tour includes moderate amounts of walking. 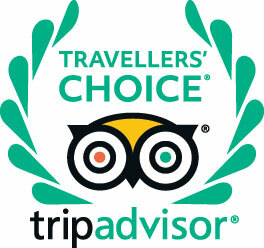 Price : 1 Guest: 85 Euro / 2 Guest and More : 70 Euro per person. We start the list with the most popular street food in Turkey. A common snack, perfect accompany to tea, and the favourite breakfast treat , simit or Turkish bagel. Allthough known as by the name Turkish bagel, simit beside its shape has no resemblance to bagel. For the first thing it is much crispier. This crippiness is achieved through dipping of the dough paste into a hint of molasses prior to encrusting it with sesames and baking it in masonary ovens. The cripiness, the slight sweet taste that comes from the hint of molasses and the slightly nuty flavour of sesames make it unresistible when it is hot. Probably therefore it is the favourite street food in Turkey now marketed as “just came out of the oven” by the street vendors. Stuffed mussels is the new street food phenomena in Istanbul. It is invented some hundred years ago in the Karakoy neighbourhood, but in it is the recent years which made it to a street food legend. We try stuffed mussels in two of our tours, in two continents tour by the eatery which is its inventor and in taksim night tour, in the fisher market, where it has became the favourite choice of the night foodies. The stuffing is usually herbed rice, pine nuts and currants. Sounds simple, but it is so good, that a lack of inhibition usually follows the first trial, so that the food meant as a snack at the end makes you fuller than you could possibly be with a proper meal. Don’t believe us? Watch the Antony Bourdains video in Istanbul and see it for yourself.. Here is another popular street food of Taksim. Unlike other street foods in the list it isn’t sold in trolleys or tray, but in the stalls of the fast food restaurants lining the enterance of Istiklal Street in Taksim. But like a street food it is meant to be a snack and always eaten standing, therefore we included it in streets foods article, rather than in fast foods article. And what is so special about wet burger. Well, the time it is eaten, since it is a post drunk classic. Well the piquant tiny tomato sauced burgers have their share of garlic, pepper and other strong herbs. There isn’t any other street food that intrigue the visitor more than chestnuts. The great enthusiasm is instantly lost when one finds out that it is the simple chestnut and nothing fancy. To add to the disappoinment I sould maybe add that it is not the cheapest street food, but a good choice if you need something filling. Boiled or grilled corn is another quite simple and common street food in Turkey. Served on green corn leaves and sprinkled with salt, it is a convenient street food for locals, which rarely consume corn at home. Cig kofte, once as legendary treat among its fans fell from grace when a law banning use of raw meat in its preparation was passed due to hygenic concerns. Well, on the bright side when you don’t eat meat, the completely vegan cig kofte, often sold also in street carts, is completely safe the consume now. Potato mash which is used instead of raw meat, the main ingridient of original cig kofte, doesn’t exactly give the taste of meat, but combined with the other ingridients, with which it is kneaded, bulgur, onion, tomato, peppers and lots of but lots of herbs, it is still something. Especially, when wrapped in a lettuce leave and consumed with a squeeze of lemon and a hint of pommegranate syrup as people used to do when there was still meat inside cig kofte! Well, here it comes again. The weirdest of all street food allready mentioned Turkish fast food article. Why? because the combination of chicken meat chunks, chick peas and rice, which is a quite tasty combination by the way, looks like a perfect home food and seem not to belonging to glass covered street cards. Believe me, locals are also usualy suspicious of this weird street food idea. Up until they try it for the first time. Than it can be an addiction depending on who your street vendor is, as some create an art from this simple ingridients and get city wide fame for that. Well, we start with the most classic one: dolma. You might be allready familiar with stuffed wine leaves. The term dolma, literally “stuffed” refers , however, to any kind of stuffed vegetables. stuffed zuccinis, cabbage leaves, bell peppers are also quite common recipes in Turkish homes. When the subject is Ottoman cuisine, you have to widen your fantasy further: stuffed melons, for example, can you imagine. It is, however, not the extraordinary fruits or the common vegetables that makes dolma one of the foods of special occasions with painstakingly long preparation times. It is the classic one: stuffed wine leaves. Well, there is a reason , that it is the most famous dolma dish among all the dolma dishes: It is simply the most delicious one, when the right amount of labour is used: Try rolling a wine leave around some filling and you will understand why it is so time consuming. Let us note also that there is a great taste difference between those carefully wrapped with good quality leaves and inattentively wrapped ones with good quality leaves assuming everything else is the same. Here is another painstaking labourious food. Dumplings originate actually from a quite far geography: It’s China where this dish is spread to the half of the world and as can be expected has taken many different forms. Now, I can here you asking, what is the difference then between Italian Ravioli and Turkish manti: Turkish manti consists exclusively of small meat chunks wrapped around a tiny dough. And this is exactly what makes its preparation so painstaking: The smaller the pieces the more it will be praised, and should you be as good as to fit forty of them on a single spoon, then you are the perfect bride candidate! Size of manti pieces certainly affect the flavour of the dish, but if you ask me it is the sauce used what makes manti such a aftersought home dish. You eat manti with some Turkish yogurt, meltet butter caramelized with tomato sauce and than add garlic , sumac and mint to spice things up.. I could it even shoes with this sauce! We continue with dough based dishes. Borek , featured also in the list of Turkish fast food is at he same time a star of home dishes. Why? Well, Home borek is a completely different story. Fast food borek is also quite delicious, in the right eateres at least, but home borek prepared with traditional family recipy, great attention to ingridients and again a lot of labor is something else: As a rule the dough or phyllo layers making up borek is home prepared and not from market shelfs, the filling, which follows family tradition, is much richer and unique, the oil quality is much higher etc. , when you prepare borek at home. Obviously the result is also dangerously good. The pastry made of dozens of the thinnest of dough layers, attractive fillings, eggs and lots of oil can help put a few pound in the shortes time. The smart thing to do is to leave home made borek to special occasions. Here comes another food, which can have quite different forms depending on the family tradition. Unlike other food in the list it doesn’t take a laborious preparation nor is it a hot main dish. We included it, nevertheless , on the list because of its association with home. You can rarely see kisir outside home and when you see it is just a remote tasteless copy of the wonderfull kisir. It is also probably the most common side dish served at homes when you have guests between meal times. The preparation is quite simple. You mix finely grained bulgur with some salad greens, tiny chopped onions, tomato paste, pepper paste, a number of herbs and maybe most importantly the incredible nar ekşisi or pomegranate syrup. Than you can enjoy the treat in lettuce leaves with a squeeze of lemon..
Should I choose the shortest possible description, cig kofte is the meaty, more spicy and more labourious version of kisir, I just talked about. It is again a mixture of a number of ingridients including finely grained bulgur, but this time the star is meat or raw meat to be exact. Because of the use of raw meat it should be neccessarily more spicy as you can imagine. what is more it needs a tremendous amount of kneading and that is the laborious part. And that laborious part is usually taken over by men, since it is usually men who knead it for hours and try sticking the patties they make out of the mixture on the ceiling to see if the mixture and amount of kneading is right! The greasy garlic and onion bomb in the disguise of stuffed aubergines is called “imam bayildi”, literally imam fainted. There are different accounts as to why Imam fainted. The obvious guess would be the extraordinary taste of the dish, but according to some it is the extraordinary cost of the expensive ingridients used in the preparation: meat used for the filling and the unbelievable amounts of olive oil that is soaked up by the aubergine. Yet for some it is just the amount and not the cost of the olive oil which is responsible for Imam’s diziness. The amount of garlic and onion used proabbly didn’t help the Imam either. Moral of the story, Imam bayildi is not for every one, but if you like your food greasy and pungent, you are going to love it! have already tasted baklava, reconsider it. If you haven’t eaten baklava in one of the finest baklava produceries in Istanbul, where the Phylo layers are micrometer thick and the butter used is an extra refined one, you haven’t eaten baklava yet. Here comes another syrup bomb. What makes this one legendary is the Turkish treaded cheese, which starts to smelt within its finely weaved pastry encasing when the desert is cooked. The smelted mozarella-like cheese, which contrast the heavy syrup added later on with its slightly sweet flavor, adds up so much to the charm of the desert, also visually: The stretching cheese when you move a piece of this delicacy to your mouth, creates amazing scenes for food photography. This scene is even more mouth-watering should you be already familiar with the legendary taste of kunefe. If you are a first timer in Turkey, you could be prone to think that the typical Turkish desert has 90 percent sugar. Well, some of them like the previous two in the list are indeed syrup bombs. But there is also a considerable amount of light-weight Turkish deserts suitable for modern palate. Muhallabia, which is an Ottoman classic living today in the whole former Ottoman territory with dozens of tasty varieties, is one of them. The Turkish variety is an extra soft, blancmange-like creamy pudding with wonderful aromas like vanilla, orange peel or rose-water and with little sugar content. If you want to spice things up a little you can try this quite light pudding with some chocolate sauce as well. Now that we have learnt about the two Ottoman classics baklava and muhallebi, it is time to learn about their yummy combination. Laz Boregi, like Turkish borek (hence the name boregi) or baklava is a layered pastry, but has a different filling than both borek and baklava: muhallabia. If you want to try the surprisingly good combination of baklava’s chrunchiness and muhallabia’s creameness you should aim for Black Sea restaurants..
Gullac like muhallabia is one of the light-weight Turkish deserts. Don’t get me wrong, light-weight stands by no means for less tasty, quite the opposite actually: Gullac is such a playful combination of subtle aromas and flavors, that you might forget about every other Turkish delight once you taste it. Just imagine the arising rose scent while you enjoy a milky, nutty treat with extra thin layers of slightly sweet rice starch. The whole is usually topped with pomegranate pieces and ground pistachio. The killing touch..
Well, the name is pretty self-explanatory, it is a milky rice pudding. It might sound ordinary. It can be also a quite ordinary pudding, but if you hit the right place where it is prepared more or less the traditional way, than you are going to find something else: A Casseroled desert with a burnt top sealing an almost fluid mixture of milk, rice and sugar trio. But can you imagine a Turkish desert without nuts? Hardly, right? Well, nuts come as a topping here. If a few spoonfuls of shredded hazelnuts are not enough for you can ask for one or two balls of vanilla ice cream to accompany them. Good luck waiting..
Why would someone call a desert tavuk gogsu, or chicken breast? You probably don’t want it to be true, but yes, chicken breast is among the ingredients of this milky desert. It may not sound very appetizing, but believe me a little protein from the finely split chicken breast fibers adds up so much to the character of this extraordinary desert, that I can with confidence put this one to the top three of my favourite Turkish deserts..
Who doesn’t know Turkish delight? This gelatinous cube, which is the precursor of jelly beans, is one of the best known Turkish deserts. If you think that it is a little too sugary for the modern-day palate, don’t buy the prepackaged ones, but good quality open Turkish delights prepared with a generous amount of nuts and honey as sweetener. Also remember, that this Ottoman invention, which’s Turkish name “lokum” is derived from the arabic expression “rahat ul hulkum” or “throat comfort”, was from the very beginning only meant as a treat consumed in small quantities. A few cubes of Turkish delight in a handkerchief was a popular gift among European high society in 19th century. And today it is customary to put one or two pieces of Turkish delight on the saucer when serving Turkish coffee. 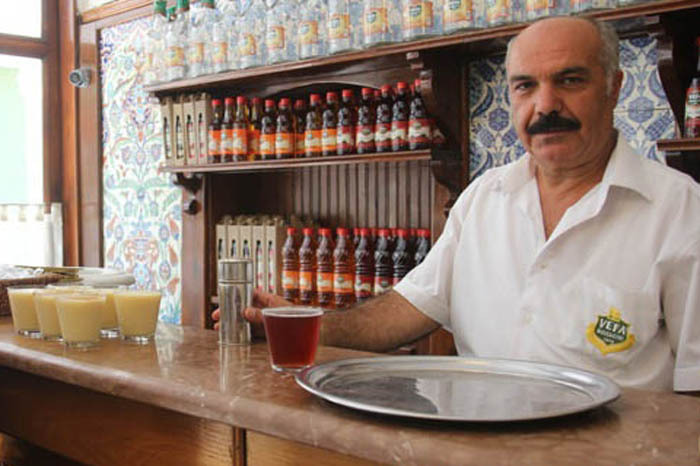 Almost every introductory video of Istanbul feature an ice cream seller in traditional dresses. In some of them you see them also on action tricking the poor tourists which have a hard time trying to get hold of their ice cream cone on the one end of a stick reached over to them by the ice cream seller. Thanks to the extra stickiness of the Turkish ice cream and quick reflexes of the seller grabbing what you paid for can be mission impossible. If you finally have your ice cream you should note that it is extra elastic beside being extra sticky and has a unique consistency and flavor thanks to the use of goat milk. If you are an ice-cream lover and open for new tastes, you should definitely take the challenge of grabbing a Turkish ice cream from the first traditional ice cream seller you stumble upon. Here is the ingredients champ of all Turkish deserts. It is a mixture of all kind of grains, dried fruits and nuts bound by a slightly gelatinous filling. The abundance of ingredients, which has a different mythological explanation in every religious culture, makes Noah’s pudding ideal for those who like it all mixed up..
Helva or halva is one of the names in this list which should sound familiar. After all the originally Arabic desert is present by the same name in a multitude of cuisines throughout the world. The most common halva type is the one prepared with sesame oil. The few varieties of halva consumed in Turkey are also made from sesame oil. You can choose between plain, vanilla, kakao and pistachio versions. The Pistachio version with chunks of Turkish pistachio kernels is the most favored one. It is, however, a good idea to limit the consumption to thin slices as the sesame oil based treat is the most calorie-rich and heavy one among all the deserts in this list. Well, I just told that halva is a sesame oil based sweet, but the name halva is also be used as a synonym for sweets in some cultures, as it was the case in the Ottoman cuisine. In Turkish cuisine, this former use survives in the name of semolina halva, for example, which being mainly a flour based home treat is quite different from the packaged regular halva. Beside Semolina, this desert features milk, butter, sugar and pine nuts. The cooking process turns the whole to a nut-butter like paste with a slightly gelatinous twist making semolina halva one of the most original flour based deserts in the Turkish cuisine. In Istanbul, this authentic taste can be found in some of the tradesman and home cooking restaurants(respectively esnaf lokantasi and ev lokantasi). Here is another quite simple home desert which is also quite common in the self-service restaurants in Istanbul. It is prepared simply by boiling pumpking pieces in water and adding sugar. Using milk instead of water adds an extra layer of flavor. favourite topping for pumpking desert is grounded walnuts. Well, the list should of course start with tea. 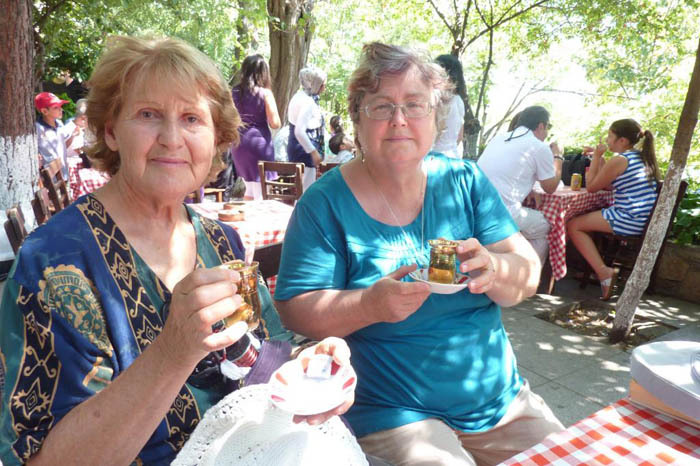 In case you don’t already know Turks are serious teaholics. There is no country in the world where more tea will drunk per person per day. You’ve also probably noticed by now that the way tea is prepared is quite different in Turkey: We use the double pot, where the upper pot is used for brewing tea, while the boiling water in the lower part serve to dilute the strong brew in the upper pot in a desired level when pouring tea to the tulip shaped Turkish tea glasses. Turks are usually quite proud about their tea and “tea tradition”, which we personally have difficulty to understand. First of all Turkish tea, which is produced in the Black Sea region of Turkey is taste and aroma-wise nothing special(wow, I feel like a traitor confessing that!) The other thing is, the funny fact that Turks didn’t drink tea at all just for some hundred years ago. And what exactly did happen at that time? The first wild tea species are discovered in the Black Sea region. Upon this discovery the newly found republic starts promoting tea instead of coffee which is an expensive export item now. This promotion is so successful that a coffeeholic nation turns into the nation consuming most tea per person in just about a century! I think it is now time to move to a really traditional taste: Sherbet. Sherbet sellers were one of the most among picturesque elements of Istanbul streets in the beginning of the last century. Dressed in traditional costumes, they carried at their back large brass containers. The long nozzle of this container ending over their shoulder allowed them to fill the glasses with the chili sherbet with a slight forward bend. Unfortunately sherbet sellers much appreciated in the hot summer months disappeared with time in the streets of Istanbul, dramatically reducing its popularity in the modern times. Today the Ottoman sherbet can be drunk only in a few confectionary shops which have been running for generations and in the good quality Ottoman restaurants, which are also quite few. If you want to drink court style Ottoman sherbet that is even more difficult, as the way Sherbet is prepared in the Ottoman court is almost completely lost since most of the recipes were kept as secret. The Ottoman sherbet tradition differentiates itself from the other sherbet traditions in India and Middle East, by the large variety of herbs used in it. It is, however one type of fruit or flower, which is the main ingredient naming the sherbet. Some of the best: Rose, tamarind, hibiscus, basil..
Boza has the thick consistency and sour flavor typical for the fermented cereal drinks consumed also some other parts of the world. This 19th century Istanbul invention, however, has also an attractive sweet note separating it from the other fermented drinks of its type. The nutritious boza, which used to be also a staple of the Ottoman army, was some twenty to thirty years ago exclusively a winter drink. Today Boza is sold across the year by all the nuts sellers of Istanbul. If you see something thick and yellowish in a plastic bottle with a small bag of cinnamon attached near its cap, that is probably boza. Most of these are made from fermented bulgur or barley, but we recommend boza made from fermented millet according to the traditional recipe by the great-grandchildren of its inventor in the neighbourhood of Vefa. A must try if you are around Suleymaniye mosque complex..
Sahlep is definitely one of the culinary wonders in the Turkish cuisine. Unfortunately finding genuine sahlep is even harder than finding genuine sherbet or boza, although the “false” sahlep is sold everywhere. The “false” sahlep still tastes good and is a must try. It is called false, since a very low percentage of the pulver the drink is prepared from is from actual sahlep or in other words from the tubers of a rare mountain orchid indigenous to Turkey. Since it is such a rarity, its export to abroad is also forbidden. This makes it the most authentic Turkish drink you can try while in Turkey. Probably also the best tasting. If you aim for the words “gercek sahlep” or “real sahlep” on a dedicated signboard of a good-looking coffee, you will probably get a few grams more of this rarity in your cup. A few grams are more than enough to turn it into a dream drink with a hint of cinnamon topping. Ayran, which is nothing more than diluted salty yogurt, is one of the original Turkish drinks. You can truly appreciate the refreshing quality of diluted salty yogurt during the hot summer months, when it is hard to inhibit your thirst for ayran. It is also the perfect company for some of the meat dishes. Although the name salgam translates to turnip, turnip is just the flavoring of the drink which actually is made of red carrot pickles. After the addition of a variety of spices and ground bulgur salgam becomes a flavor rich drink, which is, however, not for everyone! But if you like your drink pungent, salgam is the right choice for you. It is a good company to kebab and is offered in most of the kebab eateries. Should you like salgam, you can go one step further and try the extra spicy, vinegar-rich pickle juice. Even smelling of this pungent drink can sometimes be a challenge. It is not an everyday drink as you can imagine but can be drunk to spice things up every now and then. Here comes the only alcoholic drink in our list. Raki, which Turks consider as their national drink is a quite strong one with 45 to 50% alcohol content. Therefore it is usually diluted with water before consuming. Raki was traditionally produced by distilling the grape pomace twice and adding anise flavoring. Today there is a thriving raki culture in Turkey where various ingredients and methods are used to produce raki. The “yas uzum rakisi” or “fresh grape raki” is worth to try. Try it with some meze(Turkish appetizers) or simply with melon and white cheese as it is customary in Turkey. Before we finish the list with the most authentic Turkish drinks, here is the bonus, or bogus to be exact, the apple tea. What is apple tea: An artificial powder with apple aroma. Is it traditional: Well, I have seen a few times in my life locals drinking apple tea, but it has somehow an equal fame to those of Turkish coffee among tourists visiting Turkey, who often remark how good it is tasting! Well, we can’t put the blame on the poor tourists who get offered it in every corner. And if you wonder how it did manage to become an indusrty-wide practice in the entire tourism establishment. Well, looks like that it has the right combination of food chemicals: cheap, tasty, and traditional looking… Those, in touristic places, it replaced the tradition of offering the rather bitter Turkish tea to the guests. But remember, it is the biggest bogus in the food & drink scene in the country.